Welcome to JUST HOLDENS Magazine, the only magazine for all Holden enthusiasts! At last, a magazine for all Holden enthusiasts. If you believe that Holden is not just the "Commodore Car Company"
... this is the magazine for you. You don't have to have a show car or super rare factory original to be in JUST HOLDENS Magazine. 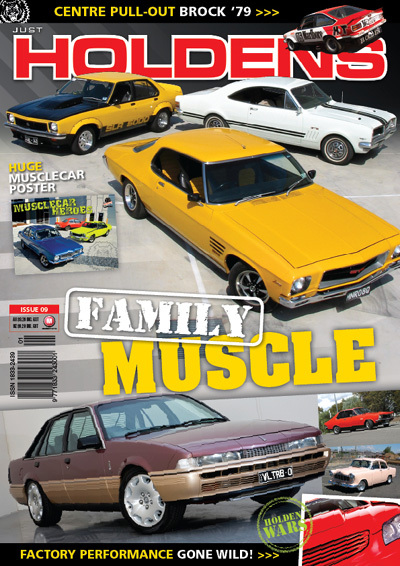 Our magazine is not for Australia's elite cars, its for all Holden enthusiasts. JUST HOLDENS Magazine features the entire spectrum of Holdens from the 48-215 (FX) through to the latest from the production line this morning. Here are the regular sections in each issue. Extreme Holdens. Is that "still" a Holden? Photo Features. Double page photos that will have you staring for hours. If you thought you knew everything about Holdens we bet you see a photo or two in the Photo Features that you've never seen before. Significant moments in "The General's" Aussie history. Specifications. Learn about important information for your restoration.